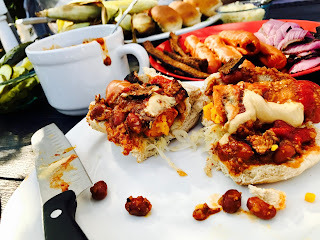 Grilling with Lightlife and Stuffed Chili Bacon Cheese Dog Recipe! Lightlife has always been one of my favorite companies for their vegan stuff. I have always loved their tempeh and was excited when they rolled our their tempeh bacon, which tastes absolutely amazing. They have been adding some awesome new plant-based products to their line, but I'm still so hooked on their vegan hot dogs, Smart Dogs. Lightlife's Smart Dogs come in two sizes, their regular (7g protein) size or their jumbo (14g protein) size. 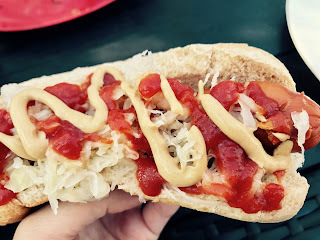 These awesome veggie hot dogs are Non-GMO Project Verified, in addition to being vegan they are also Kosher, and they are a great price, usually retailing at 3 to 4 bucks at most stores. 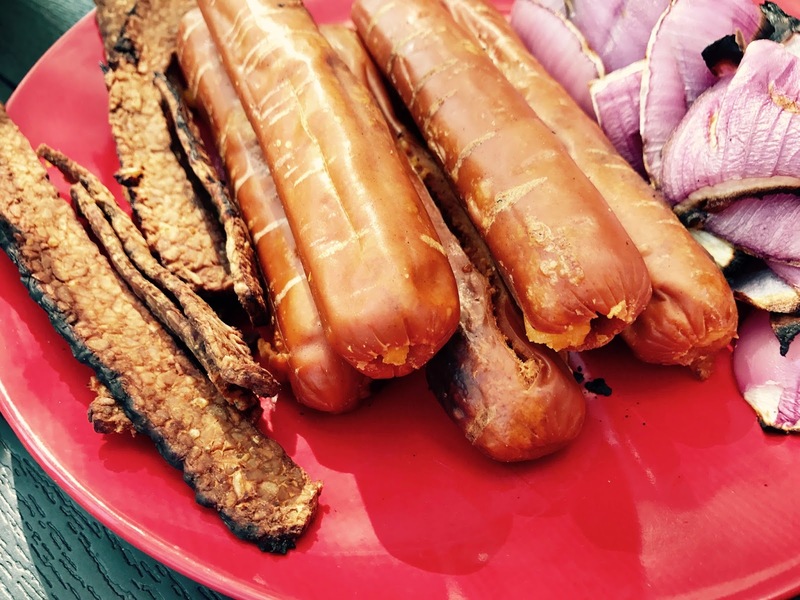 I have been using these Smart Dogs for grilling for years now, so I wanted to share a recipe that was really fun and not just "throw the veggie dog on the grill", although that's fun too! Here I decided to stuff them with cheese using a method I thought up, that ended up working pretty perfectly. 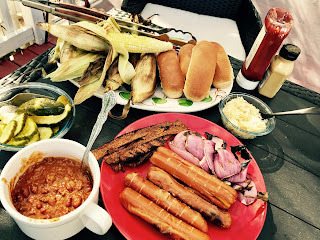 Also, some sides when grilling with these awesome Smart Dogs are grilled vegetables, like corn on the cob; that is what I enjoyed on the side with my chili bacon cheese dogs. 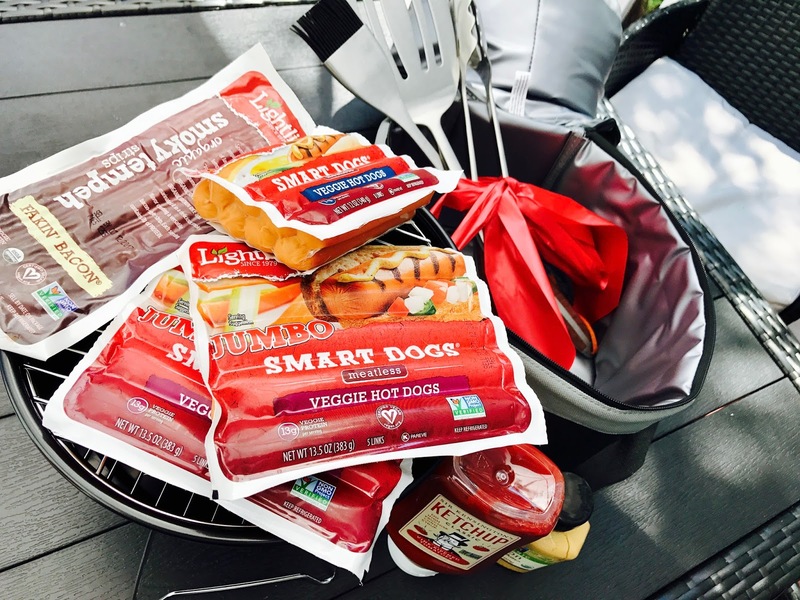 Lightlife Smart Dogs are the perfect addition (or star, in my opinion) to any vegan cookout. Let's get to this crazy-delicious recipe! -about 5 vegan cheddar cheese pieces, cut into "matchsticks"
Carefully light and prep your grill using all the proper safety precautions for grill use. Take each Smart Dog and gently push the straw through the middle, about halfway, twist then remove. Do the same to the other side of the veggie dog. You will now have a small well; push the vegan cheese sticks into it (use the straw to help push them in if you are using softer cheese instead of hard cheese - hard cheese works best). When your grill is ready for food, place the stuffed Smart Dogs directly on the grill. Place the tempeh bacon on the top basket that you warm buns, if you don't have that, place on a spot on the grill that isn't directly near the flame and cook for less time. 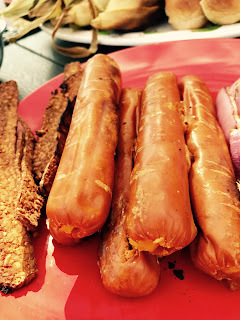 Grill veggie dogs and tempeh bacon for 2-4 minutes on each side, or adjust to your liking/ grill type. In a small saucepan, warm up your prepared chili then transfer to a bowl. 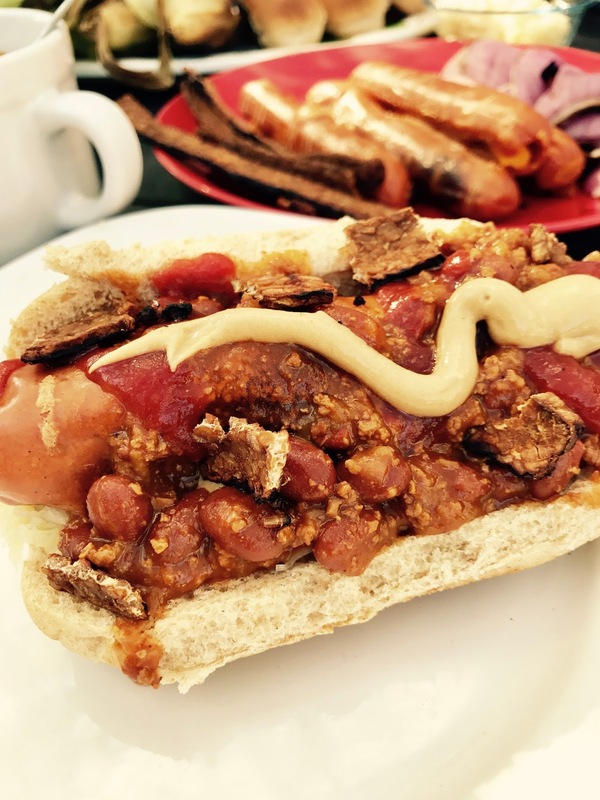 Now it is time to construct your chili bacon cheese dogs! Place your hot dog in a bun and top with chili, then take some tempeh bacon and crumble it on top. Add additional toppings, if desired. 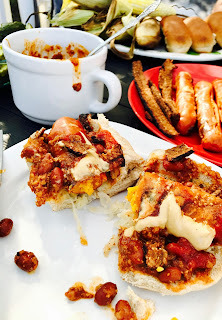 Do the same for all five stuffed chili bacon cheese dogs. What I love most about Lightlife Smart Dogs is that they taste just like classic, juicy hot dogs, but without the animal products or cholesterol. They are perfect for tailgating, camping, grilling, or any other recipe that calls for hot dogs. Mouthwatering! You can follow Lightlife on social. They are on Facebook, Twitter, Instagram and Pinterest and they are always posting delicious pictures! Big shout out to Lightlife for sending me a portable grill that doubles as a cooler, grilling tools, condiments and for sponsoring this post. You rock! And for now, the Dirty Vegan is signing off - hope your day is relaxing like a cookout day! This blog post was sponsored by Lightlife Foods.